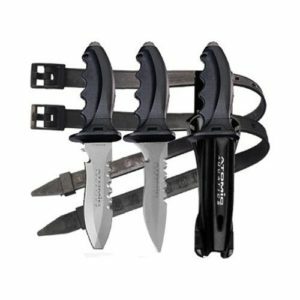 What are the different types of scuba diving knives? Where to attach the knife? Sharp-tipped knives are meant for the real adventure-thirsty scuba divers who are into spear-fishing. Do remember before buying a sharp-pointed knife that it can damage your other accessories if you aren’t careful enough. It can cause an unwanted puncture in the regulator or even cause a tear in your wetsuit. Notwithstanding the inevitable disadvantages, pointed diving knives are best suitable for spearfishing. The blade has to be sharp enough to kill aggressive marine species with a single thrust. A blunt tip knife features a flat blade which can be utilized for prying open the skin of the games. Apart from that, it can also be used as maintenance tools for boat repairing, underwater welding, cutting entangled fishnets and much more. One of the biggest advantages of a blunt tip is that it doesn’t do any damage to your scuba diving gears. 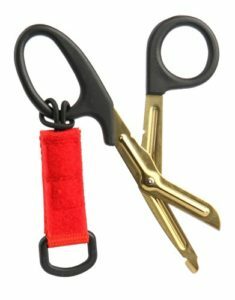 If you need a tool merely for tearing fishnets or kelp, carrying a scissor with you might just be enough. These knives can be easily mounted on BCDs. 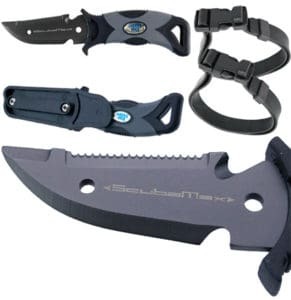 They are small and lightweight which further make them an ideal type of scuba diving knives for casual divers. 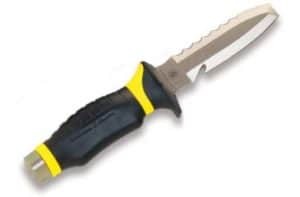 Buying the best scuba diving knife can be a difficult task to accomplish, even for the seasoned divers. In this particular section, I’ll highlight the factors that play a defining role in determining the quality, resistance and performance of such knives. Blade Size: No wonder bigger knives are attractive to everyone. If you’re under the false notion that jumbo diving knives are going to perform well under water, you’re getting it wrong. Think again about the core purpose these knives serve. In most cases, it’s nothing more than cutting fishnets or similar obstacles, a small knife, preferably around 4 inches will do you just fine. It has the right combination of strength and flexibility. However, remember that portability is an aspect you cannot overlook while scuba diving. On the other hand, while big knives have theire share of limitations, you can’t help but choose a 6 inch or longer blade if you’re a Crocodile Dundee kind of guy and dive in areas where you might get surrounded by a lot of marine predators. Just make sure it has a nicely textured handle that sticks firmly in your hand while your gloves are on. That’s all. Shapes of Blades: Scuba diving blades are either straight edge or serrated. We have already discussed the types of blade tip available in the market so not stretching that point further in this segment. Serrated edge knives are well-known for their great edge retention property. They can cut through objects easily, so, if you’re up to basic diving, a serrated blade would effectively meet your requirements. Straight edge knives are good at cutting nylon ropes, plastic objects as well as vegetation. If you want to utilize the best of both worlds, look for a knife with dual edges. Stainless steel blades for scuba diving knives come with series numbers, e.g., 300-400 series alloys. They are best suited for recreational diving purposes. Don’t let the term “stainless” beguile you because even stainless steel does catch rust, but very slowly. The lower the number, the greater its corrosion resistance. But, there’s a twist. The lower the number will be, the more prone it will be to lose its sharpness quickly. The carbon content of stainless steel blades renders them slightly high-maintenance. Let me give you a pro tip, wash your knife thoroughly with fresh water after each dive and also rub some oil or silicone on it from time-to-time to keep the edge longer-lasting. 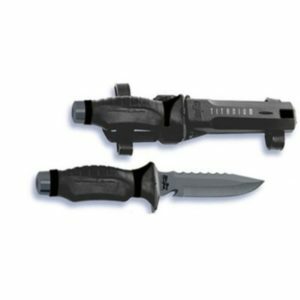 Titanium diving knives have everything a professional diver demands. It has a great edge retention, an excellent corrosion-resistance, it’s lightweight and two times sturdier than stainless steel- all these and more at the cost of almost no maintenance hassle. The one and only trade-off might be their price. Titanium blades do not come cheap. Therefore, I’ll recommend it to only pro-level divers who spend much of their lifetime exploring the mysterious beauty a thousand feet below the sea level. Where to Attach your Diving Knife? More often than not, scuba diving knives are attached to the legs or arms. Some special scuba diving knives can be strapped on to BCDs (buoyancy compensation devices) as well. Irrespective of where you place it, just make sure you’ve easy access to it with a single hand. Folding knives can be a good choice as they devise a position lock mechanism that reduces the chances of accidental blade release. Plus, they offer a great mobility and maneuverability as well. Some manufacturers also offer plastic sheaths that protect the blade from corrosion. The performance testing of a dozen of scuba diving knives wasn’t an easy task. I, along with my team, divided the whole process into a couple of stages. I started off with corrosion resistance test first as nobody just starts cutting fishnets right away with a diving knife. It’s important to conduct the test in salt water having a PSU (Practical Salinity Unit) higher than 38. To collect water with a perfect salinity range, I added 9g/kg of aquarium salt (sold in most pet shops) to 1-liter water. I also used an aquarium heater to help the water match the original temperature of seawater. I soaked all the knives in the saline water for almost 2 hours which is the average time a diver would spend underwater. After that, I dipped the knives into fresh water and again into the salt water. Then they were dried, and we moved on to the inspection. The list of materials I used for testing the cutting abilities of titanium and stainless steel knives are a 2 mm nylon braid, a ¼ inch hollow braid poly, 15 lb and 11 lb Dyneema braid, an almost 1-inch thick plastic trimmer line and a 15 and 50-pound monofilament. All these materials were used to replicate man-made and nonman-made obstacles we usually face while diving. I decided to presoak them before cutting as the lubricating effect of water makes prying difficult. Also, under wet conditions, fibrous substances become harder to grip, so it perfectly recreated the challenging environment beneath the sea surface. I also asked my teammates to wear 5 mm gloves while trying to deploy the blade. Lastly, we examined the fit and overall maneuverability for an in-depth assessment. Cressi Skorpion features a serrated edge blade which wonderfully cuts and saws tough, painfully tangled objects in seconds. It scores high in the versatility department. It is available in both blunt and sharp-tip varieties which makes the model even more sought after among both recreational as well as pro divers. The blade material used for this knife is a Japanese 420 stainless steel blade which is hailed by many for its exceptional sharpness. 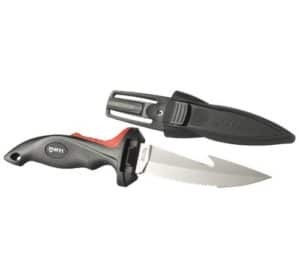 You will also find a line cutter notch on one side of the blade along with serrations which helps the divers sear the toughest lines with a minimal effort. Another feature that adds value to the product is its easy-stowing mechanism allowing single-handed opening of the blade. Be it fishing lines, nylon ropes or discarded fishing nets, if your fins get stuck in any of them while diving, you can use this knife to set yourself free in seconds. The most surprisingly good thing about Promate is that despite having a premium quality titanium blade, it doesn’t cost a fortune! The men behind Promate have certainly mastered the art of satisfying customers in every possible way. The ergonomic grip handle is located onto the tang of the knife for a stronger grip under the wet environment. The special titanium hammer at the bottom comes to use while signaling your diving partners which is again a very practical addition. The product performed exceptionally well in my corrosion resistance test. All you’ll ever need is a quick clean-up with fresh water to keep the knife in top condition for years. 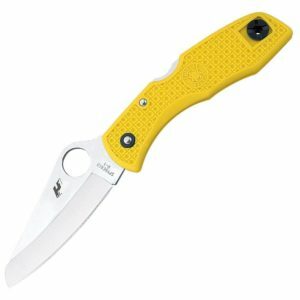 Spyderco has a lot of top-selling utility knives of all times to its credit. With Salt I, it has apparently achieved a new feat of innovation. Salt I is more than an able diving knife, it’s rather a whole package. You can use it for various tasks such as fishing, surfing, and everyday general chores at the same time. Very few knives can survive the direct exposure to highly saline water without getting rusty for such a long time. Its hollow ground blade paired with a tip-up titanium clip complement each other really well, making it a highly functional diving gear for the lovers of the wild. Its marine yellow handle is not just ergonomic but also doubles as a signaling device under water. 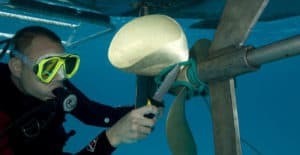 If you dive often, touching up the blade once in a while is all the maintenance it will require. If you’re constrained by budget, this particular knife model is worth a glance. 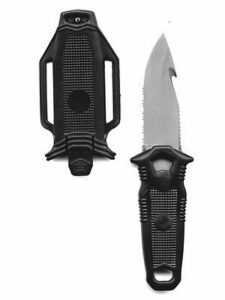 This high-end diving knife from the leading manufacturer Atomic Aquatics boasts of a titanium blade which is available with both blunt and sharp tip option. You have the option to pick one according to your specific diving requirements. 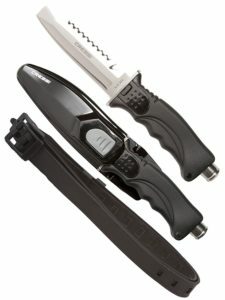 Its one-button release allows you to flicker open the blade with just a mere press of the thumb. The full-tang, hand honed, 4-inch long titanium blade is outlined with serrated edges which make it a great sawing tool as well as a robust cutter. 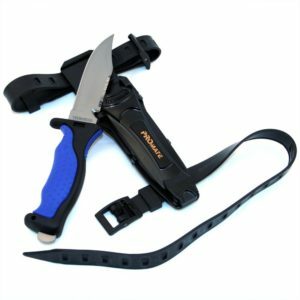 The quick adjust sheath strap is an added bonanza, it just makes carrying and drawing the knife fast and effortless. It has a 5-inch long titanium blade mounted atop its ergonomic, non-slip handle. It is a mixed edge handle combining both serrated and hollow edge for an amped up functionality under demanding conditions. Considering the price, Kinetics Titanium is one hell of a deal for casual divers who are going to explore the marine life of highly saline water. The serrated side has larger serrations than its previous version which is enhancing its power of cutting those irksome entangled fishing lines and vegetation. The sheath easily attaches to your diving suit and sticks firmly to it, a big thumbs-up to that also. Though it is primarily a serrated edge knife, a small portion of the blade at one side has a straight edge as well. However, I don’t really think it is good enough to qualify the knife as a dual edge model. Usually, stainless steel blades aren’t considered an ideal material for water with high PSU, but this blade has received PVD treatment which amplifies its corrosion resistance. Another core benefit of this model is its comfortable deploying mechanism. I could release the blade without the slightest of effort while putting on thick gloves. All in all, a decent mid-range product which is easy to carry and operate under difficult circumstances.